The longlist for the prestigious Man Booker Prize was announced this month, with several famous names sitting alongside debut novelists. Perhaps unsurprising given the series' success and popularity, Hilary Mantel features with Wolf Hall's sequel, Bring up the Bodies. Other famous names on the list are Michael Frayn for Skios, Will Self for Umbrella, and André Brink (who is nominated for his 21st novel, Philida). These individuals are in the company of several other novelists who have also written multiple books but somehow stayed off the radar: Nicola Barker (nominated for her ninth novel, The Yips), Deborah Levy (who is also nominated for her ninth novel, entitled Swimming Home), Ned Beauman (for second novel The Teleportation Accident) and Tan Twan Eng, for The Garden of Evening Mists (his second novel). Finally come the debutants: Jeet Thayil (with Narcopolis), Sam Thompson (for Communion Town), Alison Moore (The Lighthouse), and Rachel Joyce (The Unlikely Pilgrimage of Harold Fry). So who do I think is in with a shout? Rightly or wrongly, it is rare for a relative unknown to win this prize, so I would skew more towards Will Self as a possible winner (perhaps because I am already a fan of his writing). From among the more unknown authors, Ned Beauman - whose success at such a young age almost makes me wish I'd never heard of him - seems the brightest star thanks to a strong literary and journalistic track record, especially in the face of competition such as Sam Thompson's Communion Town (which gets very bad reviews on Amazon) and Alison Moore (whose debut novel, The Lighthouse, for which she is nominated, is not even available to the general public yet. The mind boggles). In any case - more on this subject once I've managed to have a closer look at the books. May the best win! Yep, there's a week for this. And I think it's so unspeakably cool that I'll be trying to spearhead a week of related activities at my school throughout its duration (September 29 - October 6, for the interested). As part of the festivities, the American Booksellers Foundation for Free Expression will help booksellers make videos of people reading from banned books and post them online. And we all know how much kids (whether reluctant or avid readers) love a video clip. More than 90 videos were produced last year by booksellers alone, with more than 800 videos being posted in total of people reading banned books on YouTube. Intrigued? Then check out http://www.bannedbooksweek.org/ for extra info. You'll find me in the resources section, printing out book lists and posters, and checking out display ideas and activities. And, if you're anything like me, you'll be buying one of these as well. The rest of the year is also packed with a whole host of stunning literary activities: as well as NaNoWriMo in November, you can also join The Great Book Migration. Vision correction specialists Ultralase, in conjunction with UK athlete Jonathan Edwards, have decided to track 100 books in a nation that spends an average of 8 hours reading per week (which, encouragingly, is higher than I would have thought). From Dracula to One Day, the books will be found in public places with 'Read Me' labels attached. The finders can then log where they found the book using QR codes, Twitter, Facebook or email. Keep your eyes open now...they really could be anywhere from airports to park benches. Plus, if you find a book, you not only get to keep it but are also entered into a draw to win a £10 Amazon voucher. So get hunting - and remember those who have lost their sight to a degree that they are no longer able to experience the joy of reading traditional books. There are plenty of cinematic treats to look forward to in the near future as yet more books are transformed into films and released on DVD for our viewing pleasure. Bel Ami, based on the 1885 novel by Guy de Maupassant and starring Robert Pattinson, Uma Thurman and Christina Ricci, was released on DVD this month, and the newest incarnation of Les Misérables on the silver screen coming out at the end of December for some countries, and at the beginning of January for others. Starring such luminaries as Anne Hathaway and Russell Crowe, it promises to be a strong contender to the 1998 version (featuring the hunky Liam Neeson). 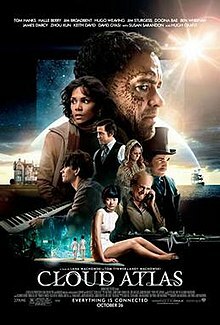 Before that, though, is the first adaptation of David Mitchell's Cloud Atlas in October, which has Tom Hanks, Halle Berry, Hugh Grant and Jim Broadbent in leading roles. What with all this excitement (plus the new version of The Great Gatsby also coming out before Christmas), I may barely be able to contain myself. I might need a cinema subscription this term. Celebrated US author Pynchon is probably most famous for Gravity's Rainbow - a weighty tome which not even I have read (although it's been on my Amazon wishlist for some time). However, this writer's back catalogue is about to become even more accessible to the modern reader due to being made available for ebook readers for the first time. Not only will Gravity's Rainbow suddenly become ultra-portable, but so will Against The Day, Inherent Vice, Slow Learner, and others. So now there's no excuse to not get cracking - although the nature of most ebook devices means other passengers on your commute won't be able to take a sneaky peek at the cover and be secretly impressed, sadly. Yep, it's the C-word - but sadly it's necessary to think this far ahead if you're like me and just go mad when faced with a plate of mince pies. There are always going to be various methods of preparing for this and putting a damage limitation strategy into action (mine will probably be Weight Watchers...again). But another strategy could lie in the hands of the raw foodists, such as Rebecca Kane, whose new book is out now. Whether you're looking to lose weight, improve your health, change your relationship with food, feel more confident, or just discover new foods, a raw food diet (even for a short time) could tick those boxes. The author lost 4 stone this way and has coached would-be raw foodists for 10 years on this particular lifestyle, before now incarnating the raw food philosophy into an easy-to-digest book for your delectation. The book, entitled Turn Your Shine On, is supposed to encourage us to reconnect with ourselves, and its recipes and tips could even help alleviate conditions such as migraines and IBS. Although the book has meal plans, it also encourages readers to choose appropriate goals and manage their own progress between stages, balancing a 100% raw philosophy with a normal day-to-day lifestyle (which doesn't mean you can never eat lasagne or cake again. YAY.). In this age of digital wizardry, it can seem alien or strange at times to pick up a proper pen or pencil. With my handwriting already having slightly schizophrenic qualities, I worry occasionally that without practice, the art of handwriting something beautifully could be lost. Ed Beerbohm, from Paperstone, agrees. “The resurgence of the fountain pen is yet another instance of our increasing appetite for nostalgia," he says. "The march of technology can be quite alienating and it is not surprising that some of us want to connect to a simpler past which the fountain pen seems to embody.” I still take great pleasure in writing handwritten letters to my special ones and fear that this, too, is a dying art. Reminiscing is supposed to be great for mental health (as long as you don't spend *all* your time doing it, presumably), so if harking back to simpler methods we can enhance our well-being, I'm all for it. I remember being at school in the late 1990s, where we were obsessed by pens of all kinds, from Parkers (Chris, I'm looking at you!) to scented gel pens (pretty much obligatory along with being total Spice Girls homies), stopping off at glittery pencils along the way. Encouragingly, fountain pen sales are rising - meaning that, hopefully, there are others out there who feel as I do. Now - where's my Parker? Have you not noticed that Will Self's book is also not yet available to the general public? Ooh - they must have rushed it out. I suspect what happens is "Ooh - we're on the longlist - RUUUN". *adds to Kindle* bring it on!